We are excited to include four artists new to browngrotta arts in art + identity: an international view. They include Brigitte Bouquin-Sellès of France and Paul Furneaux from Scotland. Brigitte Bouquin-Sellès‘ work is a mix of disparate influences. Greatly influenced by being born and raised in the province of Anjou and by her first visit to the museum located in the former Saint-Jean hospital in Angèrs (today the Jean-Lurçat Museum of Contemporary Tapestry), with its large medieval tapestry collection, Sellés studied with Nouvelle Tapestry pioneer Pierre Daquin at L’Ecole des Beaux Arts. In 1997, after years of creating tapestries with traditional techniques, she felt compelled to depart from tradition. “The great world of textile art of the 70s certainly influenced me and conveyed the idea of absolute freedom in art,” she says. The result of this freedom are works made of selvedge waste with offcuts of threads and deeply textured and manipulated works made of industrial felt. Her tapestries pit design against difference, order against disorder. 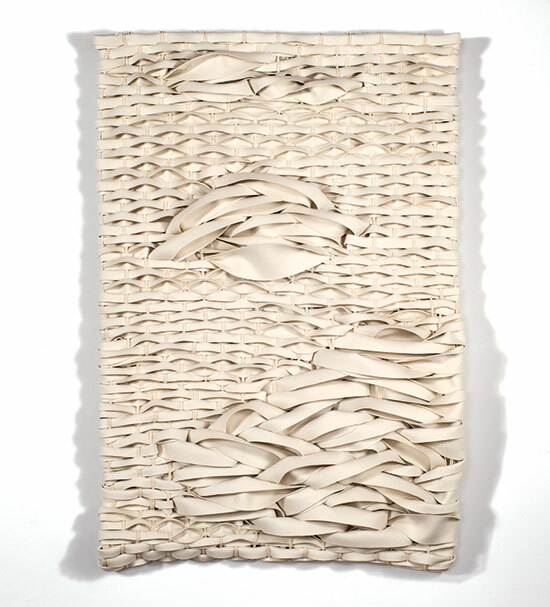 The irony is not lost on Sellés that it was a departure from tapestry convention that has led her to now work primarily with unwoven material. Sellés has exhibited at the International Triennial of Textiles, in Lodz, Poland, the Museum of Contemporary Tapestry in Angers, France and the Museum and Study Center of the History of Fabrics and Costumes in Venice, Italy. Her work is in the permanent collection of the Cooper Hewitt, National Design Museum, Smithsonian Institution, US. 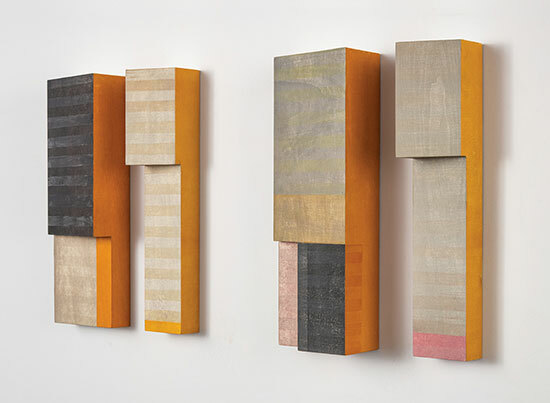 For the last decade and more, Scottish artist, Paul Furneaux, been exploring traditional Japanese woodblock printing techniques. “This inherently beautiful and simple process has allowed my work to develop in a contemplative and semi-abstract way,” he explains. Furneaux began watercolor woodblock printing, mokuhanga, on a scholarship to Tama Art University in Tokyo. He was motivated by a group of Japanese printmakers whom he had met at Peacock Visual Arts in Aberdeen, Scotland where he made large woodblocks in the early 1990s. Furneaux did not make it to Tama until 1996. Events took him first to Mexico where he painted angels, demons and masks in rich colors. “It was an exhilarating if freaky time,” he says, “ending in 46 of my paintings disappearing with an American art dealer. I then spent four years in Japan, studying Japanese and traditional woodblock techniques, finding a new way of expressing myself. A residency in Norway followed where I was surrounded by huge fjords, full of magic, with colors that were intensified by rich sunlight. The culmination was a conceptual shift — I moved from traditional flat, printed works to creating prints as “skins” to clothe three-dimensional works.” Among the themes in Mr. Furneaux’s work is a concern for the ever-changing landscape and global warming. “Rain started to appear in my work as an environmental response and continues to inhabit my thoughts,” he says. Some of his forms speak to the architecture of buildings Furneaux saw in Japan, but also imbue the soft sensual beauty of the trees, the park, the blossom, the soft evening light touching the sides of the harsh glass and concrete blocks. You can see the work of both artist’s at art + identity: an international view, this year’s annual Art in the Barn exhibition at browngrotta arts. The exhibition opens on April 27th with an Artists Reception and Opening from 1 p.m. to 6 p.m. at 276 Ridgefield Road, Wilton, CT. http://www.browngrotta.com/Pages/calendar.php. From April 28th through May 5th, you can visit the exhibition from 10 am to 5 pm. A full-color catalog will be available at browngrotta.com April 27th and we are now taking pre-orders.